With our selection of copier tab dividers, you can print your own index tabs on demand. 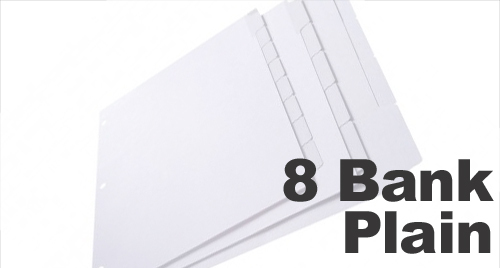 Sometimes called Xerox tabs, these dividers are made of a 90# white index stock that is designed to run through a variety of different high speed copiers including the DocuTech and Xerox DocuColor series printers. Copier tabs are available with or without mylar on the tab extensions. 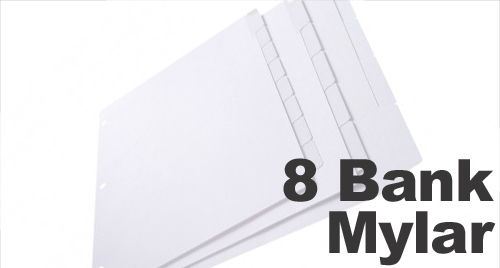 Mylar is a clear coating that adds a glossy finish and makes the tabs more durable, making them the preferred option for tabs that will be handled often or that need to last a long time. A variety of tab cut sizes are available including 1/3, 1/4, 1/5, 1/6, 1/8 and 1/10 cut. The cut indicated how many tabs are visible along the edge when the set is assembled; for example, a 1/3 cut shows 3 tabs side by side. Choose either uncollated or from two collation patterns including straight collated in 1-2-3 order, or reverse collated in 3-2-1 order. Check your copier manual to determine what kind of collation is compatible. Our copier tabs offer the highest quality so you can count on them to feed, print and run through your equipment smoothly while providing you with the professional look that your office requires. *Consult your copier's Operation Manual to ensure tab printing function exists. NOTE: These tabs will NOT work with desktop laser and inkjet printers!